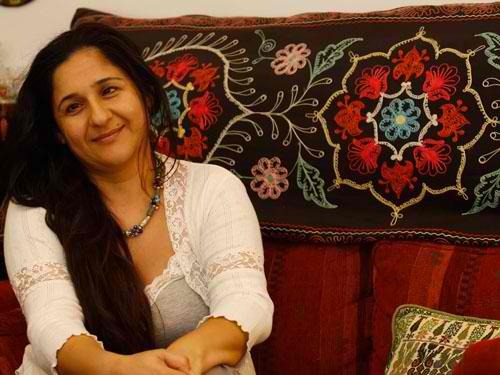 ArabLit: Why did you choose to interview political prisoners? Did you know it would lead to a play? Valantina Abu Oqsa: Definitely. When I decided to interview former political detainees, I had in mind to write a theatrical work. “Ana Hurrah,” (“I Am Free”), came about after I had spent all of 2010 immersing myself in detailed research and meeting with former political detainees. I selected them very carefully for what they revealed both about the past and about contemporary Palestinian political detention. I had been haunted by this issue for the longest time, but I couldn’t possibly begin to address it at that level of depth and complexity, not to mention risk-taking, without the requisite professional and intellectual maturity or life experience. When I set out, the road was thorny, at times even dangerous, because I went in search not just of the facts but of the minutiae involved. With extensive reading, I became increasingly aware that I knew next to nothing and that I needed to learn more: that is what led me to the ultimate challenge, which was to meet face to face with the men and women who had been freed from detention. Honestly, these weren’t meetings as much as they were a leap into the unknown and the exploration of the sorrow that had gripped me. It was a momentous experience. AL: Was your imagined audience Palestinian, more generally Arab, or something else? VAO: When undertaking a work of literary creativity, it is a mistake to box yourself in by targeting a specific people or region or group. That might be appropriate for drama destined to school audiences where you obviously must tailor the subject to the age group involved. The fundamental thing is not for whom you write but what you write about. Because “I Am Free” is a work based on documenting real life stories and testimonies, my focus was to pierce the prison walls and bring the spectator, any spectator, inside the detention cell. While I believe in the universality of human experience, I aimed for a Palestinian dramatic event: the text emerged from the specific Palestinian experience but it was universally accessible. AL: How do you feel about getting the Etel Adnan Award for Women Playwrights? VAO: Despite a successful 20-year career in the theater, I had never before received any kind of recognition or award for my work – other than mention in the media or newspapers, and the feedback of theatre-goers, professionals and other interested people. This prize was a wonderful thing, the timing was just right, it validated my work and it was international. Not only is it named for the great Etel Adnan, but it was handed to me by some of the most creative people in the world of drama and involved two pioneering theatres, the Beirut-based Masrah al-Madinah and Sweden’s Riksteatern. I cried [tears of joy] for an entire day, replaying the award ceremony in my mind and the judging panel’s words. “You deserve this,” they said. When I came back to Palestine from Sweden, I told my two hard-working parents – whose three other daughters all boast academic degrees – that I had come home with one big world-class degree. They were bursting with pride and hung the certificate in the entrance to/at the front of the house. I also felt that my husband, my children, and all those who have been supportive of me, could now be rightfully proud. AL: Do you think that such prizes will serve as an incentive to other writers? VAO: The significance of the Etel Adnan Award derives from the international renown of Etel as a creative artist and it accrues to all those who are deserving of the prize. Unfortunately, this was the third and last time that this particular prize was awarded, and it is my hope that there will be a proliferation of drama prizes – not so much to encourage or “incentivize” playwrights but to recognize the value of theatrical experimentation which remains spatially/geographically confined. And also to promote the importance of the theater as form of exploration which helps safeguard the humanism of society. AL: What else could help playwrights produce better work besides the creation of more prizes? VAO: I do not think that prizes are ends in themselves. Rather they reflect success and are, if you will, an affirmation of one’s existence. Success is underpinned by and is the result of many factors, most notably, in my view, truth, ambitiousness, perseverance, experience, and complete professionalism. AL: What are you working on at the moment? VAO: Right now I’m working on further stagings of “I Am Free” to build on the momentum of its success, and at the same time I have started the writing portion of another highly sensitive and challenging subject. This also required extensive research and interviews, and I will be disclosing the details later. I am also committed to carrying out my duties for the next three years as a board member of the Women Playwrights International Conference with special responsibility for the Arab world. Thanks to Robin Moger and Maia Tabet for translational assistance.